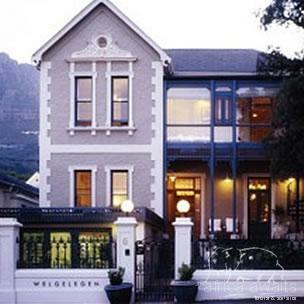 Welgelegen is a jewel of a Guest House, a gem set in a leafy cul-de-sac in the cosmopolitan city bowl neighbourhood of Gardens. Secluded and serene, it is only just around the corner from both Long and Kloof Street, two of Cape Town's trendiest restaurant and design destinations. The Guest House comprises two Victorian houses joined by a wonderful cobbled patio with plunge pool , enclosed by terraces of iceberg roses and star jasmine. You can begin your day here breakfasting in the morning sun with Table Mountain your backdrop, or end your evening under the stars with a chilled Cape sauvignon and fairylights flickering amongst the surrounding foliage. All rooms are individually furnished with earthy neutral tones and splashes of both African chic and classic bohemia. The emphasis is on comfort...from the candles, the natural Rooibos bath products and the towelling dressing gowns in each bathroom, to the home-made biscuits, complimentary port and huge inviting armchairs in each room. The beds all convert to King size, and are inviting with crisp white linen, duck down duvets and soft silky cushions. 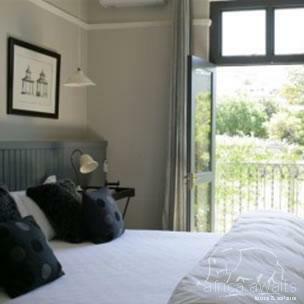 Every room has it’s own charm, most have balconies offering views of Table Mountain, Signal Hill or the patio below. 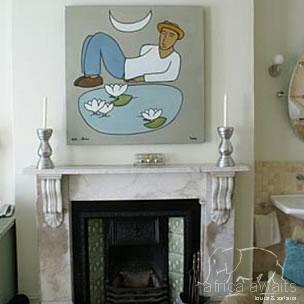 The attention to detail is reflected in the choice of artwork on the walls, the variety of books both old and new, the evening biscuit and olive bar, and the sumptiousness of the living room sofas. There is an overall feeling of luxury and spaciousness … in the modernized dining room complete with leather chairs, enormous ornate mirror and lime mosaic’d fireplace… in the huge beaded chandelier in the hallway…and in the tall windows and high ceilinged cornices of the living rooms… The atmosphere is both intimate and charming, and the room feels inviting and familiar! Fiona, has upgraded many of the older bedrooms and bathrooms marrying the old with the new, maintaining the ambience of chic afrique and timeless classicism. The still fairly new in-house treatment room provides even further pampering for the soul with holistic and polarity based massages, aromatherapy and stress release reflexology. Alternative therapies as well as manicures, pedicures, and paraffin waxes are also catered for. Welgelegen retains the ambience of a well-preserved and treasured home whilst simultaneously sharing it's warmth and sophistication with all those who venture up its hydrangea and lavender path. * Personalised, private tours and transfers at excellent rates. * Fancy a quiet dinner in for a change ? We can call in a delivery or, with a little notice, even arrange a personal chef for you. With your holiday, safari or business trip from in to Welgelegen in Cape Town.